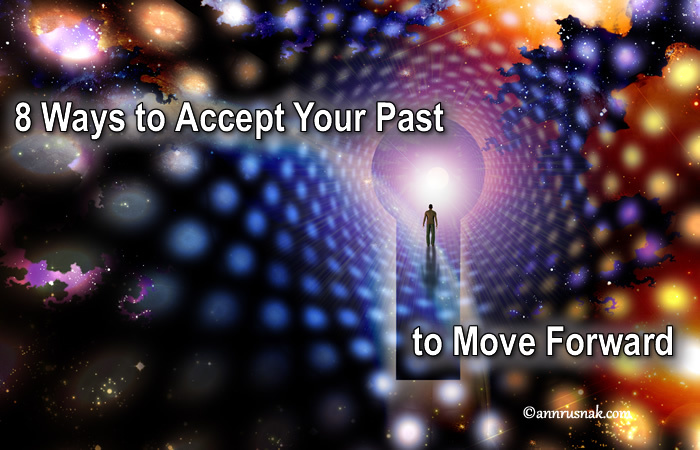 8 Ways to Accept Your Past and Move Forward. Each one of us experiences upsetting situations at one time or another. For a while, you can cope with the negative experience by pushing it from your mind. Eventually, something triggers the negative occurrence back into your thoughts and feelings. Tell yourself, "It is what it is." Whatever the disturbing experience, it happened to you. Acknowledge it. At least, accept the fact that it happened. Identify your own emotions regarding the situation. Ponder the variety of feeling "labels." Disappointment, anger, fear, and resentment are some examples. How did it make you feel then? What goes on with you emotionally when you think about the event now? Embrace all of your feelings. It’s okay to feel whatever it is you feel. You’re human. You have the right to be scared, angry, frustrated, or any other feelings you have. Give yourself permission to embrace the emotions you experience related to your past. Awareness into your emotions allows you to understand how something from the past can impact you now. Recognize you can protect yourself now. You can ensure that event won’t happen to you again. Seek and find the comfort and grace in your current position. Determine if you’re truly ready to let go of this part of your past. Can you release it into the wind and say, "It happened but it no longer defines me"? Only you can make the decision to release this negativity from your life for good. Of course, the memory will remain, but all the negativity will dissipate when you recognize and understand what happened. Think of a symbolic way to release your personal distress so you can start fresh from this day forward. Write down your trauma. Tear it up in tiny pieces and throw them away. Live your life consciously in the present. Staying in the now and vowing to live your best life each day is a powerful antidote to a painful past. Say "good-bye" to the negativity as you let it go. Replace it with a positive thought or experience. Vow to stay in each moment to relish the beauty of everything you have that’s wholesome and special to you. Go after your bliss. Your bliss is something that brings you interest, joy, pleasure, and even excitement. Seek out the things you love to do, places you love to go, and people you love to be with. Use your time on this earth to fulfill your greatest passions. Place reminders of your bliss everywhere to be pleasantly reminded of everything you love. Avoid letting anything stop you. Even though you may still have contact with someone who has hurt you in the past, recognize that you hold all the keys to how your life journey continues from this point forward. Making peace with your history is a highly rewarding experience. Learning to recognize and let go the emotions connected with your trauma will lead to a more enriched life. Live in the present, go after your bliss, and pursue your life with a renewed sense of responsibility. Make peace with your past now so you can embrace a beautiful, fulfilling life!